HMF have recently completed a new furniture store for British American Tobacco (BAT). The project was overseen by BAT’s facilities management company Johnson Controls & was built over a 3 month period at the main BAT site in Millbrook, Southampton. The main contractor project included the fit out of a single storey building with external groundworks & the complete internal refurbishment of the building. The purpose of the project was to create a new centralised furniture store for the UK to store a wide variety of furniture & office equipment for the facilities in the UK. HMF were asked to design a 2 storey furniture store using an ultra slim mezzanine floor due to the limited headroom available & managed to design a mezzanine only 192mm thick whilst still capable of holding a high storage loading. The groundworks outside the building consisted of excavating an existing roadway & path & casting a new concrete slab with fair faced brickwork retaining walls & balustrading to allow fork truck access into the building. A large sleeping policeman 6m wide was formed out of concrete to enable tailgate lorries to unload onto a higher level whilst still enabling traffic movement for vehicles & other equipment along this road. HMF employed specialist scanning sub-contractors to survey & detail the position of high voltage cables located within the area. Their positions were then physically marked on the ground to ensure high voltage cables were hand dug & protected at all times. Additional drainage gullies & manholes were fitted as well as a new foul drainage system to enable HMF to fit an additional toilet facility within the building. The building was heated by four inverter high efficiency air conditioning systems with external outdoor units run below ground in ductwork to discharge into an adjacent bunded area where they would not be visible & exposed to fork truck damage. The electrical installation was also carried out by HMF including lighting, emergency lighting & power. 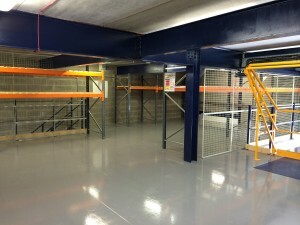 Racking systems were specified for the new space both on the ground & mezzanine level including Dexion Speedlock pallet racking with open boarded timber decking & also Dexion Longspan shelving. HMF had special ‘D’ bar dividers manufactured to enable BAT’s personnel to store vertically large worktops safely. The ground & mezzanine levels were prepared & had epoxy & polyurethane paint systems applied to both the ground & mezzanine levels. The installation was completed on programme & BAT are now using their new facilities.